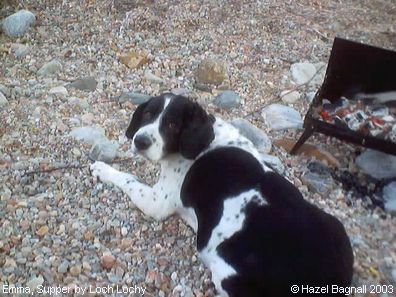 Springer Spaniels do not like to be left alone for long periods, and many of them accompany their owners on their holiday, or whenever they are away from home. Here are just a few holiday moments we've captured. 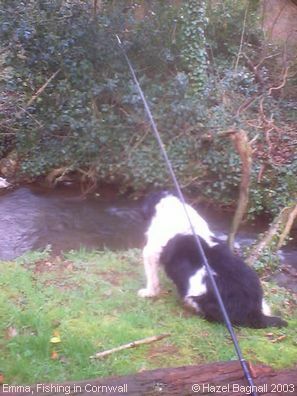 Firstly, here's Emma again, who happily accompanied her owners on fishing trips, and... well, I expect some of you will think she just came along for the ride... but this picture shows her poised on the bank ready to pounce for a bite, and sometimes she caught the biggest fish! 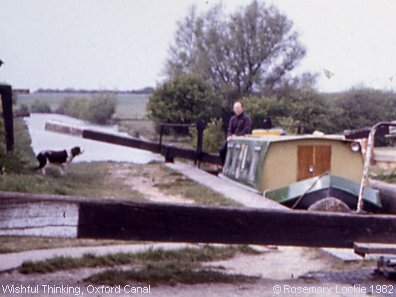 Above we have a photo of Emma fishing. Here she is waiting anxiously for supper - fish being barbecued on the shores of Loch Lochy in the Western Isles of Scotland. 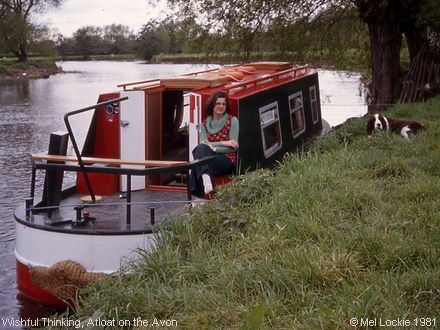 “Messing About on the River” - Rosemary onboard with Mish on the bank recovering from the trauma of her first trip on board a canal boat on the River Avon. Mish never learned to enjoy riding on the boat, but she would have hated the idea of being left behind even more!